Frugivorous birds are phenologically linked to the fruits that they eat. When there is less fruit in seasonal environments, frugivorous birds complement their diet by eating invertebrates. The depth of the phenological link between frugivorous birds and their dietary resources has not been studied until now. The objective was to determine the possible phenological synchrony between the Austral thrush (Turdus falcklandii) and its dietary resource, fruits and annelids, found in the fragmented forests in the South of Chile. The numbers of thrushes, annelids, and fruits in fragments of native forest and anthropogenic grassland in Chile's Lake District were estimated annually. Spatial variation (i.e., forest and grassland) and seasonal variation (i.e., the period of greatest fruit growth and least fruit growth) on thrushes, annelids, and fruits were analyzed with a nonparametric Scheirer-Ray-Hare extension for the Kruskal-Wallis test. The graphic representation of the seasonal variation of thrushes, annelids, and fruits was carried out using cubic spline routines. It was found that there are seasonal changes in the dietary resources of these birds. During the period of greatest fruit production, there was a trend towards a higher number of thrushes in the forest where there was a greater availability of ripe fruit in relation to the nearby grasslands. In the grasslands, the annelids demonstrated a trend towards greater quantities in comparison with the forest. There was a positive and significant correlation between the thrushes and the annelids and fruits, indicating phenological synchrony between this bird and its dietary resources. Therefore, we concluded that the thrush responded numerically and functionally to the variations in its resources. The result of our research underlines the importance of grasslands in maintaining thrush populations, with this bird acting as one of the most important seed dispersers in the temperate southern forests of Chile. Frugivory or the consumption of fruits is a mutualistic interaction between plants and animals, which results in the satisfaction of the nutritional needs of the animal and in some cases the dispersion of the plant seeds. Seed dispersal is fundamental in accounting for the distribution, abundance, and maintenance of both kinds of interacting organisms (Lindenmayer and Fischer ). The ability of frugivores to monitor the abundance of fruit, both spatially and seasonally, is fundamental for efficient seed dispersal (Telleria et al. ). In fact, this link between frugivores and fruit has been documented in various geographical zones with regard to its seasonal dimension (i.e., phenological synchrony), observing a consistent pattern and generalized adjustment between the abundances of both kinds of interacting organisms (Loiselle and Blake ; Guitian and Munilla ; García et al. ). In temperate and subtropical forests, the fruiting of plants with fleshy fruits is markedly seasonal, directly influencing the seasonal fruit-eating patterns of frugivores, which are often birds (Blendinger et al. ). However, if the offer of fruit in the environment falls, the birds do not behave as strict frugivores but rather as facultative frugivores, consuming other dietary resources (e.g., invertebrates). This change in diet allows the birds to link themselves seasonally and spatially with alternative resources, aside from fruits. In this way, they sustain their nutritional requirements throughout the year (Rey ). In the temperate southern forests of South America, the dispersal of fleshy fruit seeds that are mostly consumed by birds, as well as its many seasonal variations, is a phenomenon attracting increasing interest and one that has been progressively studied in recent years (Armesto et al. , Armesto et al. ). As a result of these studies, it has been determined that the Austral thrush Turdus falcklandii Quoy & Gaimard 1824 is a key species in the dispersion of the seeds for the majority of forest plants with fleshy fruits. Its relevance as a seed disperser lies in numerous factors, such as (i) its large population size (Armesto et al. ; Armesto et al. ; Rozzi et al. [1996a]), (ii) the high frequency with which it eats fruits (Armesto et al. ; Aizen et al. ; Amico and Aizen ; Salvande et al. ), (iii) its annual residency (Armesto et al. ; Willson et al. ), (iv) its ability to eat fruits with diameters that are larger than the dimensions of its beak, which allows it to eat fruits of a wide range of sizes (Willson et al. ; Vergara et al. ), and (v) the scarcity of other frugivorous birds (Armesto et al. ; Rozzi et al. [1996a]). Contrary to the forests, the grasslands in the south-central of Chile do not have a natural origin, having been established at the end of the nineteenth century for agroproductive purposes (Armesto et al. ). Currently, agricultural grasslands have replaced most of the native forests, with the latter surviving as partially changed fragments of an average size of 6 ha (García et al. ). This replacement of the vegetation has caused, on the one hand, a reduction in the supply of fruit and, on the other hand, the creation of an alternative habitat with new dietary potential. This allows the maintenance and conservation of the frugivorous birds during the season where fruits are more scarce (Atkinson et al. ). In these grasslands, there is a large abundance of annelids (Lumbricus spp., Alfaro et al. ), which could represent an important food source for the thrush, particularly in winter when fruits are scarce. In spite of this, agroproductive grasslands are currently perceived as lacking in value for the birds' conservation. Thrush populations and the ultimate phenological synchrony with their dietary resources, whether they are fruit or invertebrates, as well as the spatial variations presented by the forests and grasslands, have not yet been studied. For this reason, the aim of this study was to determine the possible phenological synchrony between the thrush and its dietary resources, in the forest and grassland landscape of the South of Chile. Given the marked seasonality of the fruit production in forest plants and probably also of annelids in the grasslands, and considering that the thrush consumes both dietary resources, it is expected that forest-grassland seasonal variations will be observed in the number of thrushes, concomitantly with the number of fruits and invertebrates. The study area (ca. 125 km2) is located in the province of Osorno (40° 53′ 56′′ S - 72° 53′ 27′′ W, 160 A.S.L. ), close to Llanquihue Lake. In Osorno province, there is a cold wet season during the winter months and in turn a warm season with less precipitation in summer. The average annual precipitation and temperature recorded in the year 2010 were 1,331 mm and 13°C, respectively (http://164.77.222.61/climatologia/). The study was carried out in forest fragments surrounded by grasslands, which have optimal conditions for finding a large number of woody species with fleshy fruit and encompassing a wide range of fruit production throughout the year (Figure 1A). Matrix and Austral thrush. (A) Matrix composed of fragments of forests and grasslands. (B) Austral thrush Turdus falcklandii main seed disperser of temperate forests of southern Chile. Ten differently sized forest fragments were selected (between 3 to 180 ha) based on the presence of at least five species of trees and shrubs with fleshy fruits per fragment, while also considering that each fragment must be entirely surrounded by a network of grasslands. In addition, ten grassland sites bordering each of those fragments were selected. The vegetation of the forest fragments is classified as the inland temperate laurifolious forest strata of Nothofagus dombeyi (Mirb.) Oerst. and Eucryphia cordifolia Cav., of which only 54.8% (i.e., 5,589 km2) of the original surface area remains (see Luebert and Pliscoff  for details). The grassland vegetation consists of perennial and annual grasses used for forage as they are, for the most part, of allochthonous origins (Luebert and Pliscoff ). The thrush is a medium-sized bird (26 cm long), widely spread throughout Chile, from the Atacama region down to the Magallanes region as well as in Argentina (Figure 1B, Araya and Millie ). In the study area, the thrush was observed eating earthworms (Lumbricus spp. ), as well as the berries and drupes of eight woody plants: Amomyrtus luma (Mol.) Legr. et Kausel. (Myrtaceae), Amomyrtus meli (Phil.) Legr. et Kausel (Myrtaceae), Aristotelia chilensis (Mol.) Stuntz (Elaeocarpaceae), Drimys winteri J. R. et G. Forster (Winteraceae), Maytenus boaria Mol. (Celastraceae), Myrceugenia planipes (H. et A.) Berg (Myrtaceae), Persea lingue (R. et P.) Nees ex Kopp, and Rhaphithamnus spinosus (Juss.) Mold. (Verbenaceae); therefore, the study was based on the phenological monitoring of these species. Previous reports suggest that the fruits of these species form a regular part of the diet of the thrush in the forests of South Chile (Armesto et al. ; Valdivia and Simonetti ; Vergara et al. ; Bustamante-Sanchez and Armesto ). To estimate the spatial-seasonal variation of the thrush throughout the year, each of the sites within the study was visited monthly, from October 2009 to November 2010. In each fragment of forest (n = 10) and each associated grassland, two transects of 200 m long by 50 m wide, separated from one another by 500 m, were established. In the forest, transects were placed from the edge of the forest towards its interior (Bibby et al. ). In the grasslands, transects had the same dimensions and separation distance, but in contrast to the forest, here transects were located from the edge of the forest towards the grassland. Each transect was sampled during the 4 h after dawn, although the exact time varied due to the changes in the sunrise throughout the year. In this way, while the transects were being traversed, all individual thrushes observed or heard within them were recorded. To estimate the spatial-seasonal variation of annelids throughout the research year, four grids of 25 m2 (5 × 5 m) were set up, two in each grassland and two in each fragment. In each grid, 15 soil samples measuring approximately 9.375 cm3 (25 cm wide, 25 cm long, and 15 cm deep) (Lee ) were taken at random. The grids in the forest interior were placed approximately 50 m from the edge. In the grasslands, the grids were placed at the same distance from the edge of the forest. The number of annelids (i.e., Lumbricus spp.) in each ground sample was calculated in the field, without identifying them at the species level. To estimate the spatial-seasonal variation of fruit, five circular plots each of 100 m2 and separated by 50 m were distributed in each of the above-mentioned transects. In each plot, an individual of each of the plant species whose fruit the thrush had been observed eating was identified and marked. Each month the phenology of fruit production, the number of fruits, and the number of trees and shrubs with fleshy fruits were recorded. The number of fruits was estimated by way of high-resolution photographs of the tree and shrub tops. Each photograph corresponded to a 1-m2 section of the top taken from a distance of 3 to 9 m from the ground. For each photograph, all of the fruits per branch were counted. To estimate the error associated with this technique, branches with fruits making up 1 m2 of the canopy were randomly chosen and cut, and these were also counted. The results indicated that there were no significant differences between the numbers of fruits estimated using the photographic method and the direct count (figures not shown here). Subsequently, the average number of fruits per individual plant (i.e., tree or shrub) was estimated using the product of the number of fruit per square meter and the size of the treetop, with the latter being calculated from the height of the treetop and its average diameter (see Vergara et al. for details). Finally, the total number of fruits per transect was estimated from the product between the total production of fruits per species and the number of species of plants with fleshy fruits (García et al. ). To evaluate the effects of spatial variation (i.e., forest and grassland) and seasonal variation (i.e., period of greatest fruit production from December to May and least fruit production from June to November) of thrushes, annelids, and fruits, the non-parametric Scheirer-Ray-Hare extension for the Kruskal-Wallis test, which is equivalent to a fully 2 × 2 factorial analysis of variance (ANOVA), was used (for details, see Sokal and Rohlf , p. 466). This test was used since the data did not comply with the assumptions of normality required for traditional ANOVAs. To evaluate the number of thrushes as a response to the fruits and annelids, a multiple regression analysis was used. In all cases, the units analyzed were the monthly averages, per period of fruit production and for each of the sites, expressed as the average number of individuals (birds, annelids, and fruits) per transect or grid as applicable. Each analysis was carried out with the STATISTICA v. 7.0. statistics package. The graphic representation of the seasonal variation of thrushes, fruits, and annelids was carried out using cubic spline routines (Schluter ), while the multiple regression graph was carried out using the STATISTICA v. 7.0. statistics package. Throughout the period of greatest fruit production in the forest, a monthly average (±S.E.) of 2.13 ± 0.66 thrushes per transect was estimated. In the grassland, a monthly average (±S.E.) of 2.06 ± 0.64 per transect was obtained. In this period, specifically between the months of December and May, a trend towards a larger number of thrushes in the interior of the forest fragments and a smaller number of thrushes in the grassland was found (Figure 2A,B). During the period of least fruit production in the forest, a monthly average (±S.E.) of 1.33 ± 0.61 thrushes per transect was calculated. By contrast, in the grassland, a monthly average (±S.E.) of 4.73 ± 2.30 thrushes per transect was obtained, with a trend towards a larger number of thrushes in this area recorded in the months of June and November, which is the opposite of what happened in the forest (Figure 2A,B). No significant effects of space, season, or the interaction of both were found on the number of thrushes (Table 1). Spatial and temporal variation of the austral thrush Turdus falcklandii and its food resources. (A) Thrushes in forests, (B) thrushes in prairies, (C) annelids in forests, (D) annelids in prairies, and (E) fruits in forests. Mean variation curves (solid lines) and 95% confidence intervals (dashed lines) were obtained after performing spline cubic routines with 10,000 bootstrap replications, respectively. During the period of greatest fruit production in the forest, a monthly average (±S.E.) of 0.40 ± 0.27 annelids per grid was recorded. In the grassland, a monthly average (±S.E.) of 2.33 ± 1.30 annelids per grid was found. During this period, in the forest, a trend towards a larger number of annelids between the months of June and November was observed, just as in the grassland. During the period of least fruit production in the forest, the monthly average (±S.E.) was 1.0 ± 0.64 per grid. In the grassland, a monthly average (±S.E.) of 3.96 ± 1.79 was observed, with a trend towards a larger number of annelids in this area between the months of June and November, a similar variation to that observed in the forest (Figure 2C,D). 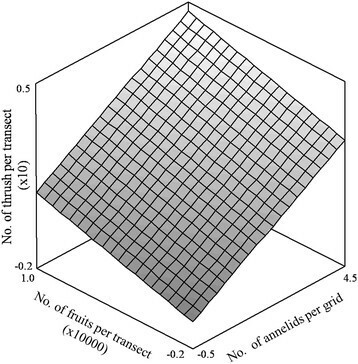 No significant effects of space, season, or the interaction of both were found on the number of annelids per experimental grid (Table 1). In the period of greatest fruit production, a monthly average (±S.E.) of 17,812.77 ± 10,558.37 fruits per transect was estimated. In the grassland, only one individual of Rubus ulmifolius with fruit (n = 33 fruit) was found. In this period, both the fruits recorded in the forest and the fruits of the individual in the grassland presented their greatest fruit production between the months of December and May (Figure 2E). In the period of least fruit production in the forest, a monthly average (±S.E.) of 1,460.97 ± 762.55 fruits per transect was obtained. The production of fruit varied significantly both spatially and seasonally, although there was not an interactive effect between the two variables (Table 1). Regarding the nine species of plants studied, the largest number of fruits throughout the year came from the native tree R. spinosus and the allochthonous weed R. ulmifolius (Table 2). The fruit and annelids accounted for 32.04% (R2 = 0.3204) of the variation in the number of thrushes in the study area. In fact, the number of thrushes varied positively and significantly both with the annelids (F = 109.07; P < 0.001) and with the fruit (F = 990.61; P = 0.042) (Figure 3). Effects of the numbers of fruits and annelids on the austral thrushes Turdus falcklandii. The thrushes did not demonstrate significant spatial-seasonal differences during the year either in the forest or in the grassland. However, there was a trend towards a higher concentration of individuals in the interior of the forest during the period of greatest fruit production (southern summer and the start of spring), probably in response to a greater availability of fruit. In turn, during the period of minimal fruit production (winter and spring), a higher concentration of birds was observed in the grasslands in response to a reduction of fruit in the forest and an almost constant concentration of annelids throughout the year in the grasslands. It is important to point out that the absence of significant spatial-seasonal differences in the number of thrushes can possibly be attributed to the effect of the small sample size (i.e., number of fragments and grasslands in this case) rather than a biological phenomenon. In fact, by carrying out a power analysis to estimate the minimum number of forest and grassland fragments that would need to be studied in order to find significant spatial-seasonal effects, it was possible to determine that 22 fragments of forest and 22 associated grasslands would be needed. Given that it is feasible to find many more fragments and grasslands than those highlighted by the power analysis in the stratum of vegetation in which the study was carried out, we concluded that the absence of significant spatial-seasonal effects on the abundance of thrushes reported here corresponds more to a statistical artifact than to a biological reality. The dietary dependence on fruit during the period of maximum fruit production could explain the variation in the number of thrushes in the interior of the forest throughout the year, which is similar to that described by other birds of the Turdus genus that also live in temperate biomes (García et al. ; ). This feeding pattern is concordant with the peak of greatest availability of fleshy fruits, which was seasonally marked. In fact, our results agree with phenologies previously reported by Smith-Ramírez and Armesto () and Riveros and Smith-Ramírez () for temperate forests in the south of Chile and, in more general terms, for other temperate biomes where seasonality has also been described as an important characteristic in the productivity of plants with fleshy fruits (Blendinger et al. ). Just as for the thrushes, the annelids did not demonstrate significant spatial-seasonal differences throughout the year. However, there was also a slight trend showing a greater concentration of annelids in the period of least fruit production, probably due to the fact that they tend to remain closer to the surface of the ground during this period of the year, unlike during dry periods when they seek out greater depths (Gruar et al. ). Our observations support this idea, since it is possible to observe the thrush eating annelids in the grassland throughout most of the day at this time of year. It is worth noting, in addition, that the time of year with the greatest consumption of annelids coincides with the reproductive period of the thrush (i.e. month of September) (Johnson ), during which they require food with a higher volume of proteins to satisfy their nutritional demands (Chamberlain et al. ). Although the number of grids was limited (only two grids per fragment), the values obtained for the average of annelids in fragments and grasslands were fairly similar, allowing for a good characterization of the annelid populations in these habitats. As has been pointed out above, the number of thrushes in the forest and grassland demonstrated a close correlation with the fruit. This phenological link is in full agreement with the hypothesis of spatial-seasonal monitoring of fruit (Burns , Blendinger et al. 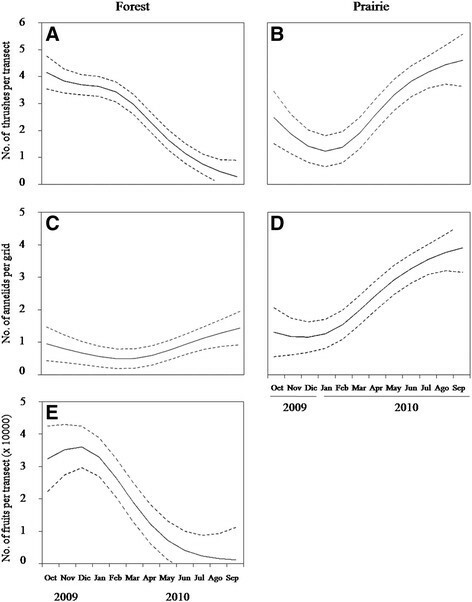 ), which predicts that changes in the abundance of frugivorous birds are strongly correlated with changes in the availability of fruit. This situation, plus the fact that the high population of the thrush is associated with its annual residency, its ability to eat fruit with larger dimensions than its own beak, and the absence of competitor birds in the interior of the forests apart from during summer, make the thrush the primary seed disperser in the temperate southern forests of Chile (Armesto et al., , Rozzi et al. [1996b], Amico & Aizen , Vergara et al. ). As a consequence, the phenological synchrony and the relationship of dietary dependency on fleshy fruits that the thrush shows would be keys in the success of the mutual relationship between the plants and this bird, when interacting with a large number of plant species in the forest. Nevertheless, the ongoing destruction of the forest in the central valley has given rise to circumstances in which only 7% of the original coverage remains in certain sectors (Otero ). This has caused the transformation of the original landscape, from one dominated by extensive stretches of forest into one dominated by grasslands with distinct characteristics (e.g., agricultural and/or for ranching) and small remnants of forest, in which an accelerating reduction in the richness and abundance of fleshy fruit for the thrushes can be observed (Vergara et al. ). For this reason, the current grasslands and in particular the close phenological synchrony between the thrushes and the annelids would be of great importance for maintaining viable populations of this bird and, consequently, to ensure the reproductive success of the plants of the forests that depend on this seed disperser. In other biomes on Earth, it has been demonstrated that grasslands frequently constitute true sink habitats for species of bird that are rare or have conservation problems and that they sustain their feeding during a particular period of the year (e.g., Turdus philomenos) (Perkins et al. ; Atkinson et al. ). In spite of their importance, our observations in the field indicate that the grasslands are currently showing signs of progressive deterioration resulting from the development of intensive agricultural and ranching practices, with an apparently indiscriminate use of fertilizers and pesticides. This appears to have strong and negative repercussions on the abundance and availability of ground invertebrates (Atkinson et al. ). These circumstances will undoubtedly have direct, negative consequences on thrush population viability and indirect consequences on the regeneration of the plants dispersed by birds in the remaining fragments of forest. On another front, the constant pressure of hunting to which the thrushes are subjected during the winter, with hunting activities legally permitted (Hunting Law 19.473, Republic of Chile), is probably reducing the population of these birds at an uncalculated rate, since the effect of this activity on the mutualistic interactions, and certainly on the regeneration patterns of the forests in the interior of the scarce remaining fragments, is unknown. Additional research to evaluate the population status of thrushes depending on the changes to the landscape, specifically with regard to the structure of the agricultural landscape, as well as the regeneration patterns of the plants in the remaining fragments of forest, is imperative in establishing appropriate conservation strategies to ensure the maintenance of the fragmented southern temperate forests in the south of Chile. The thrush T. falcklandii is a key disperser of the temperate rainforests of southern South America. Unfortunately, these forests have been logged and fragmented to create anthropogenic prairies for forestry and cattle. In fact, in some cases, more than a half of the original surface of forests have been converted into these new types of habitats where almost no fleshy-fruited plants inhabit. Despite this fact, thrushes are also able to consume earthworms at these prairies, although following the temporal-spatial variation of fruits and earthworms at forests and prairies. Accordingly, T. falcklandii responds numerically and functionally to the variations in its food resources. Consequently, the present results highlight the importance of grasslands in maintaining thrush populations, with this bird acting as one of the most important seed dispersers in the temperate southern forests of Chile. The current study had the support from the Dirección de Investigacion y Postgrado of the Universidad de Los Lagos, the Magister en Ciencias, Mensión Producción, Manejo y Conservación de Recursos Naturales, and the Laboratorio de Vida Silvestre and the Laboratorio de Ecología, both of which belong to the same institution, the Instituto de Ecología y Biodiversidad (IEB). Thanks are also due Centre for Studies in Biodiversity to Chile (CEBCh) for providing the personnel for the fieldwork and working with the equipment for data analysis. Particular thanks go to the owners of the land for facilitating access and the opportunity to remain on site during the sampling season throughout the study period. The first author sincerely thanks all those who contributed in different ways to this study, including Enzo Pizarro, Andrés Morales, Aldo Arriagada, and Claudio Tobar and his son Valentín Orellana. The authors declare that they have no competing interests and also declare that they read and approve the final manuscript. JIO carried out the fieldwork, statistical analyses and drafted the manuscript, CSR and JRR sponsored the work and substantially contributed to improve field design and an early draft of the manuscript, SS and AG supported fieldwork and contributed to improve the manuscript, and CEV contributed to improve the manuscript and also advised statistical analyses.